AVO reported that on 6 June the Volcanic Activity Alert Level for Fourpeaked was lowered from Advisory to Normal and the Aviation Color Code was lowered from Yellow to Green based on declining rates of seismicity and gas emission. Following the 17 September 2006 phreatic eruption of Fourpeaked volcano and subsequent non-juvenile ash emissions and debris flows (Cervelli and West, 2007; BGVN 31:09), low level seismicity (up to M 1.8) and emissions (S02 fluxes up to almost 3,000 tons/day) continued during late 2006 and the first half of 2007. Small explosions occurred during February-April 2007 amidst declining gas emissions. The Alaska Volcano Observatory (AVO) lowered the Aviation Color Code and Volcano Alert Level from Yellow/Advisory to Green/Normal on 6 June 2007 (on a scale from Green/Normal to Red/Warning). Seismic monitoring network. Prior to the 2006-2007 eruption and unrest, Fourpeaked lacked a monitoring network (BGVN 31:09). A network of monitoring instruments was deployed in stages following the onset of unrest in 2006 (figure 8). The network consisted of 4 short-period seismometers (3 newly-deployed and 1 pre-existing), 2 co-located pressure sensors, and a web camera. As a result of the stepwise deployment of the instruments, the precision and number of earthquakes successfully located by AVO increased during the active period. Following the network's successful operation through the winter of 2006-2007, Fourpeaked was formally recognized as the 31st seismically monitored Alaskan volcano on 3 May 2007. Figure 8. The seismic monitoring network of Fourpeaked volcano. Orange stars indicate the 4 short-period seismometers monitoring Fourpeaked; black stars indicate other nearby seismometers; triangles indicate volcanoes. Modified from Gardine and others (2011). November 2006-June 2007 activity. AVO reported that low level seismicity and persistent steaming (reaching up to several hundred meters above the summit) continued through the end of 2006. McGimsey and others (2011) reported that an airborne gas survey on 6 November 2006 showed continued elevated S02 emissions (~1,000 tons/day). The measured S02 flux measured soon after the 17 September eruption (figure 9) was more than 2,000 tons/day (McGimsey and others, 2011). In January 2007, AVO reported an earthquake swarm (swarm IV, figure 9), but stated that it was not considered unusual. Until 8 February, activity was typical of the past few months. Figure 9. Recorded syn- and post-eruptive seismicity and S02 emissions at Fourpeaked volcano. Plots indicate the number of earthquakes per month (gray bars), timing of earthquake swarms (I-IV, vertical dashed black lines), and measured S02 emissions (tons/day, dark gray points and trend). The data extend 13 months following the 17 September 2006 phreatic eruption (swarm I). Courtesy of Gardine and others (2011). Beginning on 8 February 2007, AVO reported small explosive events that were registered on seismic and acoustic instruments, and a possible large steam plume that was noticed in a partly cloudy satellite view. A swarm of 13 locatable earthquakes occurred on 18 February, the largest of which was an M 1.8 event at ~4 km deep; this was the largest seismic event of the 2006-2007 Fourpeaked activity (McGimsey and others, 2011). A gas overflight on 22 February recorded S02 flux values below those measured in November. Occasional small eruptions continued through March 2007, while seismicity gradually decreased (McGimsey and others 2011). In the last week of March, AVO reported decreased steam emissions from the vents at the summit. Explosive activity and declining gas emissions continued throughout April, and on 18 May, an aerial gas measurement revealed that the S02 flux had decreased to less than 90% of the measured values in September 2006 (Cervelli and West, 2007). On 6 June 2007, citing declining seismicity and gas emissions, AVO lowered the Aviation Color Code from Yellow to Green, and the Volcanic Activity Alert Level from Advisory to Normal. They noted that "local hazards still [existed] near the summit, including jetting steam and/or very small explosions, unstable snow and ice, hot water and rock, and the possibility for high concentrations of dangerous volcanic gas." Magma intrusion. 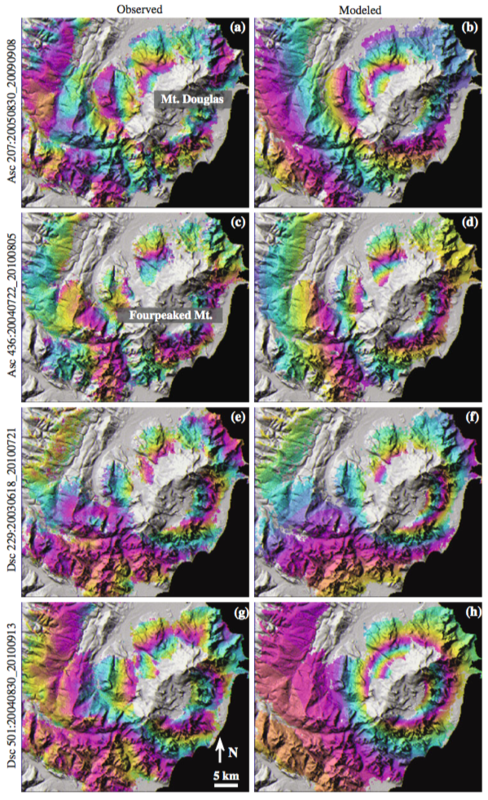 Gardine and others (2011) analyzed seismic and gas emission data from the 2006-2007 Fourpeaked eruption and unrest (figure 9) in order to constrain the origin of the eruptive activity. Their findings suggested that the high levels of seismicity and gas emissions during the initial unrest indicated the intrusion of new magma into the upper 10 km of crust. They suggested that the intrusion reactivated fractures, allowing gases exsolved from the magma to be released at the surface. They argued that continued exsolution provided the gases released during the period of unrest, while local stress accumulation led to earthquake swarms (figure 9). They also suggested that the activity ceased only after the magma had cooled and degassed to a point where it became trapped and could no longer overcome the overburden pressure. References. Cervelli, P.F. and West, M., 2007, The 2006 Eruption of Fourpeaked Volcano, Katmai National Park, Alaska, American Geophysical Union, Fall Meeting 2007, abstract ##V31E-0719. Gardine, M., West, M., Werner, C., and Doukas, M., 2011, Evidence of magma intrusion at Fourpeaked volcano, Alaska in 2006-2007 from a rapid-response seismic network and volcanic gases, Journal of Volcanology and Geothermal Research, v. 200, issues 3-4, p. 192-200 (DOI: 10.1016/j.jvolgeores.2010.11.018). McGimsey, R.G., Neal, C.A., Dixon, J.P., Malik, N., and Chibisova, M., 2011, 2007 Volcanic Activity in Alaska, Kamchatka, and the Kurile Islands: Summary of Events and Response of the Alaska Volcano Observatory, US Geological Society Scientific Investigations Report 2010-5242, 103 p.
The AVO reported that earthquake activity and gas emissions continued at Fourpeaked during 14-20 October. Steam-and-gas plumes rising from a location near the summit were visible on a recently installed web camera. The AVO reported that earthquake activity and gas emissions continued at Fourpeaked during 7-13 October. Observations through most of the week were hindered due to cloud cover, but on 12 October AVO staff reported that two prominent vents were emitting steam and gas. The AVO reported that volcanic unrest continued at Fourpeaked during 30 September-6 October. A seismometer that was installed on 25 September indicated ongoing low-level seismicity. Due to the limited number of seismometers, earthquake epicenters were not located. Emission rates of sulfur dioxide were high, similar to the previous week. Volcanic unrest continued at Fourpeaked volcano during 23-29 September. Satellite observations by scientists from the University of Maryland-Baltimore County indicate that sulfur dioxide emission was continuing. Early in the week, AVO conducted several helicopter and fixed-wing missions during which observers photographed a linear series of vents running N from the summit for about 1 km. Some of the vents were vigorously emitting steam and other volcanic gases. Thermal measurements of up to 75°C were recorded at the vents, although steam was likely obscuring hotter areas. Adjacent glacial ice had been disrupted and showed signs of subsidence. Airborne gas measurements taken on 23, 24, and 30 September documented high emission rates of sulfur dioxide, hydrogren sulfide, and carbon dioxide, and a distinct sulfur smell was evident up to 50 km from the summit. An AVO status report on 3 October noted that cloudy conditions had prevented visual or satellite observations, but limited seismic data now being received did not indicate significant volcanic activity. 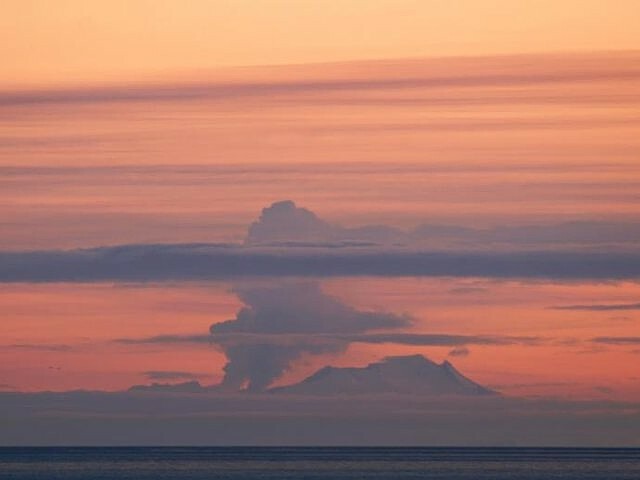 On the evening of 17 September the Alaska Volcano Observatory (AVO) received several reports of two discrete plumes rising from the Cape Douglas area, about 320 km SW of Anchorage. Retrospective analysis of data from the NEXRAD Doppler radar in King Salmon showed an unusual cloud starting at 1200 that day. The maximum cloud height determined by radar during the first hour of the event was 6 km (20,000 ft) a.s.l. The radar return from the cloud continued until at least 2145. A cloud of sulfur dioxide gas was observed by colleagues at the University of Maryland Baltimore County over the Cape Douglas/Fourpeaked region at 1500 using data collected by the Ozone Monitoring Instrument (OMI) on NASA's Aura satellite. On this basis all of the clouds were inferred to be volcanic in origin. Although satellite data did not detect ash during this event, AVO received reports of a trace of ashfall at Nonvianuk Lake outlet (110 km WNW) and near Homer (150 km NE). Both fixed-wing and helicopter overflights in the Cape Douglas area 20 September confirmed the source of volcanic activity to be Fourpeaked volcano. AVO raised the Level of Concern Color Code from "Not Assigned" to YELLOW on 20 September. Fourpeaked and Douglas volcanoes are not monitored seismically. A 23 September observation flight conducted in relatively good weather permitted the first look at the summit since the event of 17 September. Observers saw a linear series of vents running N from the summit for about 1 km. Most of these vents were vigorously emitting steam and other volcanic gases. Gas measurements indicated abundant quantities of sulfur dioxide, hydrogren sulfide, and carbon dioxide. Until the eruption of Fourpeaked on 17 September, evidence for eruptive activity in the past 10,000 years was uncertain. The volcano is largely glacier covered with only isolated outcrops (figure 1). This report discusses the initial observation of plumes and subsequent activity until the end of October 2006. Fourpeaked is in S Alaska ~ 320 km SW of Anchorage. It is SW of the mouth of Cook Inlet and within NE Katmai National Park (figure 2). Figure 1. Fourpeaked volcano, the glacier-covered peak at the upper left is one of a group of poorly known volcanoes NE of Katmai National Park. In the foreground of this photo is Kaguyak caldera, which hosts a 2.5-km- wide lake. Pre-eruption photo at uncertain date taken by Chris Nye (Alaska Division of Geological and Geophysical Surveys, Alaska Volcano Observatory. Figure 2. A map showing the location of Fourpeaked and Douglas volcanoes, Cook Inlet, and adjacent settlements including the city of Homer on the SW Kenai Peninsula. Created by Seth Snedigar and Janet Schaafer, AVO-ADGGS. On the evening of 17 September, AVO received several reports of two discrete plumes rising from the Cape Douglas area. The plumes were photographed at an unstated time on 17 September from the town of Homer (figure 3). At this stage, neither Douglas nor Fourpeaked had devoted seismic instruments. Figure 3. A photograph of the eruption of Fourpeaked on 17 September 2006. The photo was taken from Main Street in Homer at an unstated time. Copyrighted photograph by Lanny Simpson, Alaska High Mountain Images (shown on AVO's website). Retrospective analysis of data from the NEXRAD Doppler radar in King Salmon showed an unusual cloud starting at 1200 on 17 September. The maximum cloud height determined by radar during the first hour of the event was 6 km altitude. The radar return from the cloud continued until at least 2145 (figure 4). Figure 4. Image from the King Salmon NEXRAD weather radar showing the volcanic cloud at Fourpeaked on 17 September 2006 at 1240 (2040 UTC). In color the radar reflectivity ranges from light blue (low) to dark green (moderate), which corresponds to greater numbers and/or sizes of particles. It cannot be determined whether the signal is due to large water droplets, ice particles, coarse-grained ash, or a mixture. Image created by Dave Schneider, AVO/USGS, using data and software from the NOAA National Climatic Data Center. A cloud of sulfur dioxide gas was observed by colleagues at the Volcanic Emissions Group at the University of Maryland Baltimore. They used data collected at 1500 by the Ozone Monitoring Instrument (OMI) on NASA's Aura satellite (figure 5). Figure 5. Image showing the total amount of sulfur dioxide over Fourpeaked on 17 September 2006 as measured by the Ozone Monitoring Instrument on NASA's Aura satellite. Sulfur dioxide is displayed in Dobson Units (DU, a measure of the number of molecules in a unit area of the atmospheric column). Image created by the Volcanic Emissions Group at the University of Maryland Baltimore County. On the basis of the suite of visual, radar, and satellite observations, all the 17 September clouds were inferred volcanic in origin. Although satellite data did not detect ash during this event, AVO received reports of a trace of ashfall at Nonvianuk Lake outlet (110 km WNW) and near Homer (150 km NE). 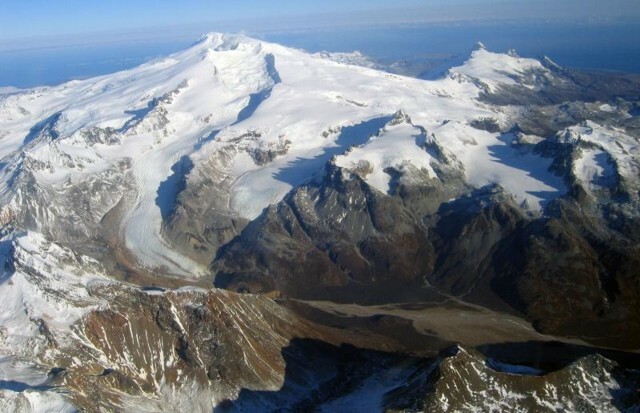 Field observers saw deep scouring of a glacier flowing W from the summit, indicating flooding, probably from the 17 September event. In the caption to a 20 September AVO photo by K.L. Wallace there was noted a "continuous layer of discolored snow and ice above [~1 km elevation,]~3,000 feet asl on the NE flank of Fourpeaked volcano (S of Douglas volcano). Could possibly be ash from the 9/17/06 event." Both fixed-wing and helicopter overflights in the Cape Douglas area on 20 September confirmed the source of volcanic activity to be Fourpeaked volcano. AVO raised the Level of Concern Color Code from "Not Assigned" to YELLOW on 20 September. A 23 September observation flight conducted in relatively good weather permitted the first look at the summit since the event of 17 September. Observers saw a linear series of vents running N from the summit for about 1 km. Most of these vents vigorously emitted steam and other volcanic gases. Gas measurements indicated abundant quantities of sulfur dioxide, hydrogen sulfide, and carbon dioxide. Thermal measurements of up to 75°C were recorded at the vents, although steam was likely obscuring hotter areas. Adjacent glacial ice had been disrupted and showed signs of subsidence. Airborne gas measurements taken on 23, 24, and 30 September again documented high emission rates of sulfur dioxide, hydrogen sulfide, and carbon dioxide, and a distinct sulfur smell was evident up to 50 km from the summit. An AVO status report on 3 October noted that cloudy conditions had prevented visual or satellite observations, but limited seismic data being received did not indicate significant volcanic activity. The AVO reported that volcanic unrest continued at Fourpeaked during 30 September-24 October. A seismometer installed on 25 September indicated ongoing low-level seismicity. Due to the limited number of seismometers, earthquake epicenters were not located. Emission rates of sulfur dioxide were high during 4-10 October and on 27 October. Observations were hindered due to cloud cover, but on 12 October AVO staff reported that two prominent vents were emitting steam and gas. Figure 6 shows several shots illustrating the enlarged opening in the ice on 15 October. Figure 6. Photographs of the steaming vent area at Fourpeaked volcano on 15 October 2006. Courtesy of Kate Bull (AVO-ADGGS). On 20 October, field crews installed a web camera located 16 km (10 miles) N of Fourpeaked. Steam plumes originating from vents along the summit were visible via the web camera on 27 and 30 October. Steaming continued through at least 4 November (figure 7). Figure 7. A 4 November 2006 photograph documenting steaming on the uppermost section of the northern flank of Fourpeaked volcano. Courtesy of Jennifer Adleman (AVO/USGS). Information Contacts: Alaska Volcano Observatory (AVO), a cooperative program of the U.S. Geological Survey, 4200 University Drive, Anchorage, AK 99508-4667, USA; Geophysical Institute, University of Alaska, PO Box 757320, Fairbanks, AK 99775-7320, USA; and Alaska Division of Geological & Geophysical Surveys, 794 University Ave., Suite 200, Fairbanks, AK 99709, USA (URL: http://www.avo.alaska.edu/); S.A. Carn, N.A. Krotkov, A.J. Krueger, and K. Yang, Joint Center for Earth Systems Technology (JCET), University of Maryland Baltimore County (UMBC), 1000 Hilltop Circle, Baltimore, MD 21250, USA. 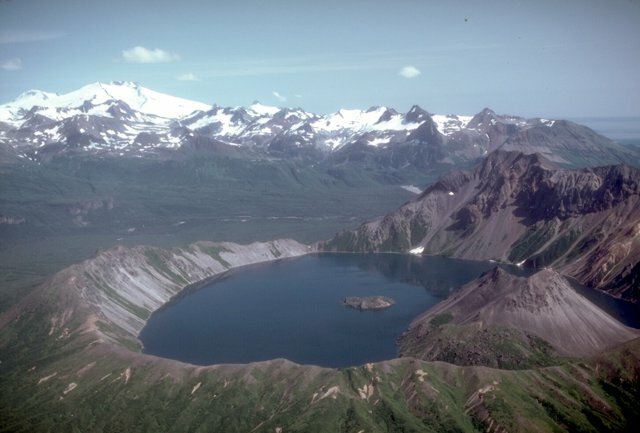 Poorly known Fourpeaked volcano in NE Katmai National Park consists of isolated outcrops surrounded by the Fourpeaked Glacier, which descends eastward almost to the Shelikof Strait. The orientation of andesitic lava flows and extensive hydrothermal alteration of rocks near the present summit suggest that it probably marks the vent area. Eruptive activity during the Holocene had not been confirmed prior to the first historical eruption in September 2006. A N-trending fissure extending 1 km from the summit produced minor ashfall. Remarks: An uplift signal between Fourpeaked and Douglas is either due to magma or isostatic rebound. Fourpeaked volcano, the 2104-m-high glacier-covered peak at the upper left is one of a group of poorly known volcanoes NE of Katmai National Park. Much of the volcano's surface is hidden beneath Fourpeaked Glacier; the few exposed outcrops are lava flows interlayered with volcanic agglomerate. Rocks near the summit are extensively hydrothermally altered. The age of the volcano is not known. In the foreground is the dramatic young, 2.5-km-wide Kaguyak caldera, filled by a lake and 3 lava domes. Photo by Chris Nye (Alaska Division of Geological and Geophysical Surveys, Alaska Volcano Observatory). A plume rises above Fourpeaked volcano during its first historical eruption on September 7, 2006 as seen from Main Street in Homer, across Cook Inlet. The plume rose to a maximum height of 6 km and produced a trace of ashfall at Nonvianuk Lake outlet (110 km WNW) and near Homer (150 km NE of the volcano). The eruption originated from a linear fissure 1 km long that extended north from the summit. Copyrighted photo by Lanny Simpson, 2006 (courtesy of USGS/AVO). Glacier-covered Fourpeaked volcano in NE Katmai National Park is seen here from the south with the Swikshak River in the foreground. Isolated andesitic outcrops surrounded by the Fourpeaked Glacier form the summit. Holocene eruptions at Fourpeaked had not been confirmed prior to its first historical eruption in September 2006. Photo by Jennifer Adleman, 2006 (U S Geological Survey, Alaska Volcano Observatory). There are no samples for Fourpeaked in the Smithsonian's NMNH Department of Mineral Sciences Rock and Ore collection. Large Eruptions of Fourpeaked Information about large Quaternary eruptions (VEI >= 4) is cataloged in the Large Magnitude Explosive Volcanic Eruptions (LaMEVE) database of the Volcano Global Risk Identification and Analysis Project (VOGRIPA).